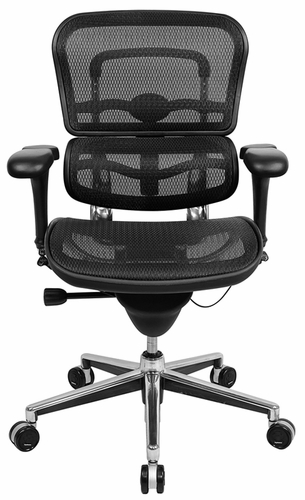 The ME8ERGLO Ergohuman Chair is the low back, headrest-free version of the ME7ERG Ergohuman Chair. 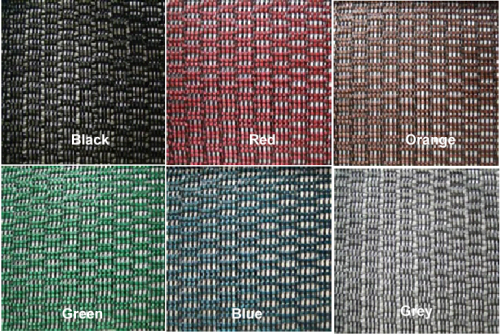 This versatile and durable mesh ergonomic office chair offers full-body support, exceptional comfort, and easy adjustability at a desirable price-point. Designed for all-day use, the ME8ERGLO Ergohuman Chairs provide a wide range of users the comfort and support to suit their individual needs. Lifetime Warranty - Every Ergohuman is backed up by a warranty that covers all working parts for the lifetime of the product. 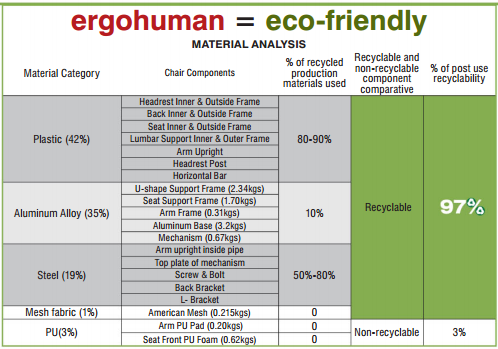 The Ergohuman chairs offer all the adjustability features you expect from a high quality, ergonomically designed chair. With the exception of the headrest, all models have identical features. The back angle adjustment provides users a comfortable range of postures while working - from sitting completely upright to a deep recline, and this works in tandem with the tilt tension adjustment that also comes standard on the Ergohuman. 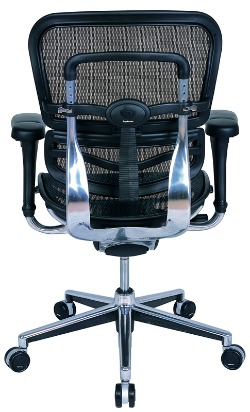 The addition of the tilt lock allows users to set the Ergohuman in a variety of fixed positions. Unlock the tilt lock lever to recline back in your chair or quickly lock the Ergohuman's back in one of the fixed positions, including upright. Raise or lower the back height to support the lumbar (lower back) region of your spine. Synchro-tilt mechanisms allow for the backrest and seat to tilt in unison, opening up a user’s posture between the spine and hips as they recline. The seat back adjusts in proportion to the seat in a 2:1 ratio as a user reclines. This control ensures that the Ergohuman tilts back comfortably (not too fast or too slow) when you want to recline. This feature allows you to change the depth of the seat to accommodate your leg length, keeping your back in contact with the backrest while avoiding pressure behind your knees. A pneumatic height-adjustable cylinder allows you to raise or lower the seat height on your Ergohuman Chair so your feet can rest flat on the floor. This allows the Ergohuman to accommodate individuals of all different heights; The Ergohuman is most comfortable for people above 5'2" and below 6'2". The adjustable Ergohuman arms raise or lower so your forearms rest comfortably while typing at a computer and working at your desk. The headrest is available on the Ergohuman ME7ERG, LE9ERG and CU9ERG models only; the range of adjustment is about 4". To adjust your headrest, hold both sides of the headrest and slide it up or down until it sits where you want it to. Afterward you can also adjust the angle of the headrest. The headrest is available on the ME7ERG, LE9ERG and CU9ERG models only. Using your hands on both sides of the headrest, roll the headrest up or down until you have it where you want it. There are four back height levels on the Raynor Ergohuman Chair. 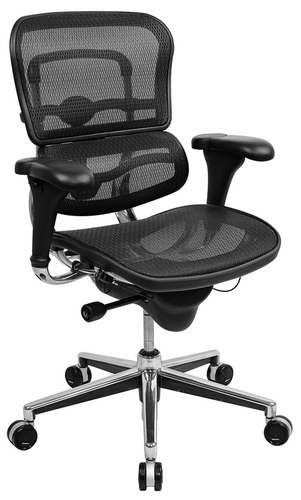 At the proper height, the back offers optimal lumbar support and allows room for your shoulders to roll back comfortably. To adjust the backrest height, release both clips on the silver frame and slide the backrest up or down. Synchro-tilt changes the seat angle along with the back angle when you recline, so you don’t have to make any adjustments here. However, there are different tilt positions you can lock your chair in; otherwise, leaving the tilt lock open lets you rock back and forth. If you are the type of user who prefers not to lock your chair in a specific angle, you can tighten or loosen the tilt tension to better support you when sitting upright or when reclining. The lever for this adjustment is just below the seat pan on the left side. Push this lever forward to allow the chair to recline freely, or push the lever back to lock the tilt. The knob on your right side of your Ergohuman chair lets you change the tension of the tilt mechanism so that it rocks back comfortably and allows you to sit up easily as well. Turn the knob to loosen or tighten the tilt tension. The height of your armrests adjusts easily via the buttons located on the outside of your armrests, underneath the armpads. Pull the button upward to release the armrest and slide it into your desired position, then let go of lever to lock it in position. It's not uncommon to want to change the pivot angle of your armrest as your work needs change during the day. Armpads on the Ergohuman Chair will adjust for a total of 16° of overall adjustability. To adjust, simply grab the front of the armpads with your hands and move them inward or outward. Ergohumn V2 models feature arms that also pivot backward and forward. Ideal positioning requires that your feet rest comfortably, flat on the floor. To raise or lower your seat, reach underneath the right-front of your seat pan to locate the seat height adjustment lever. Pull back on the lever while still applying your body weight to the seat to lower it into position. To raise it up, remove your body weight from the chair while holding the lever. Correct ergonomic posture places the front of the seat pan comfortably behind your knees with your back resting securely on the backrest, and the back of your legs not touching the seat. Reach underneath the right of your seat pan to locate the seat depth adjustment lever. Pull back on this lever, releasing the seat pan lock to slide the seat freely forward and backward. Lock the seat back in place when you find the correct seat depth.